My run for office began AFTER the biggest land coup in recent Affton history was underway...that of the sale of 94 acres of rolling farm land owned by Andrew Busch (yes, Busch like "Anheuser") next to Grant's Farm and Cor Jesu Academy. You can catch up on the story in the Post or the Journal. 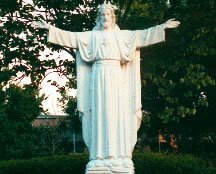 Anyway, after several all-school assemblies, mass demonstrations at the St. Louis County Council meeting and countless hours emailing the Prayer Hotline, I'm pleased to announce (before it's in the Journal) that Cor Jesu has reached a deal with the developers. The unflappable Sr. Sheila has apparently been able to purchase 10 acres next to the school for future development. I have not seen this published anywhere yet, but the First Lady of Affton is an alumna of the school and received an email with the announcement. I'm happy they worked things out as it's likely that the Mayor will be paying for the First Daughter to go there in about 12 years.